There were plans for a Vampirella film to be made by Hammer Films, famous for their dominance of the horror film market in the 1950s and 1960s in conjunction with Warren Publishing. The lead role was, of course, to be played by Barbara Leigh. However, this was not to be and the project never got off the ground - though you can get hold of copies of the original script on eBay if you wait long enough! In 1996 Vampirella was launched upon an unsuspecting world. I have yet to meet a vampirella fan who really likes this film. Definitely a "B" movie, it starred Talisa Soto in the lead role, with Roger Daltry of The WHO playing Dracula. Perhaps it is the influence of Hammer films' classic Dracula films, but a short, English Dracula with blond curly hair really wasn't convincing. Nor was Talisa Soto as Vampirella ... and her costume looked like it was made out of red plastic rubbish bags. The story harkened back to the Warren era with Dracula being an escaped criminal fleeing to Earth from the planet of Drakulon, pursued by vampirella seeking revenge for Dracula's killing of her family ... The sci-fi sets of Drakulon were not over inspiring, and the story on Earth was a bit tepid. Not necessarily the actors fault, miscast, miswritten and low-budget this film had "doomed to fail" written all over it! However there are probably enough Goth, vampire-philes and Vampirella fans out there to keep it selling at a trickle via eBay and Amazon - either in it's own right or part as a double DVD vampire set paired with Night Hunter (I dread to think what that film is like!). I have this film on both DVD and VHS, but it isn't high on my "must watch again soon" list. I appreciate the try guys, but no prizes for second best. This is a Blood Drive Premium item distributed at the Comic Book Extravaganza in New York City in 1997. It was part of a package of exclusive premiums made available to blood donors only. This particular item features three frames of Vampirella on her home planet of Drakulon with an elder! Authorised by Harris Publishing, who attended each event, each sealed piece of film is 100% original and was sent directly from the movie’s director specifically for the event. 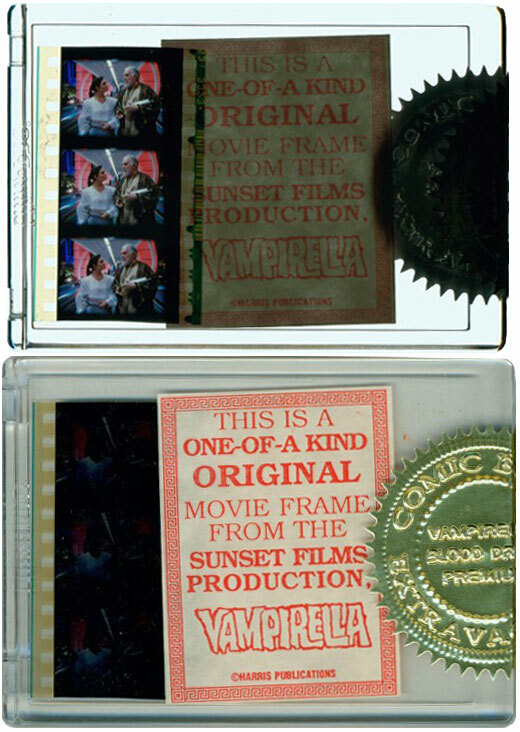 Each encasement bears a gold foil seal, so this is not just a piece of film cut from a reel. 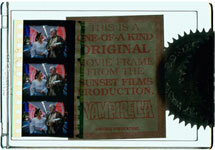 These were never sold to the public, and there are less than 75 Blood Drive Movie Film Premiums in existence. Which means that if you owned all 75 sets of frames and spliced them all together you would end up with about four seconds of the film. I am guessing that these frames are not from the original Master tape; more likely scraps of film taken from the cutting room floor! Music from the 1996 Vampirella film. I haven't got this yet, but now I know it exists I'll track down a copy eventually and provide a review. 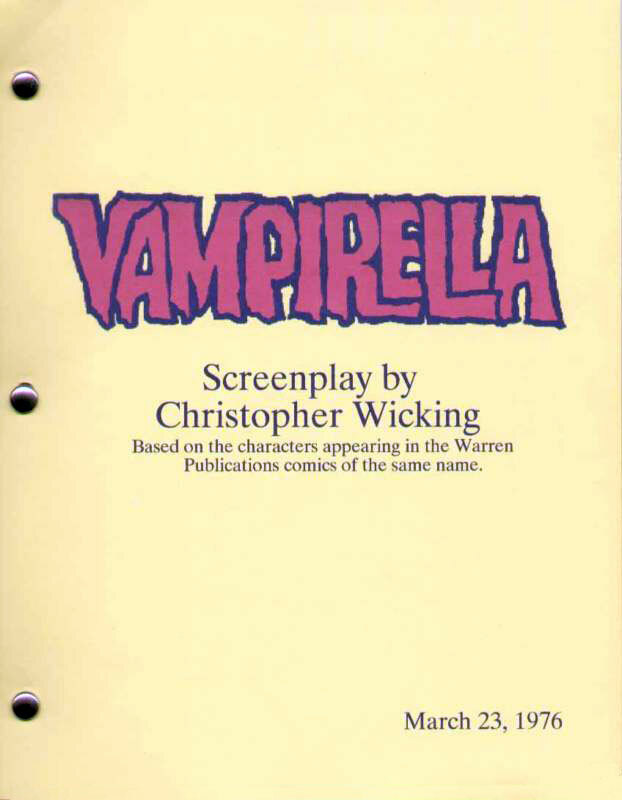 This comes up on eBay now and again, the "original" film script for the aborted Hammer Horror Vampirella film. Both Carolyn Munro and Barbara Leigh were in the running for the title role, though Barbara was the final choice. Peter Cushing was also short listed to play Pendragon. I don't have a copy (yet), but by all accounts the film was rather tame by today's standards. If anyone wants to give a more detailed review of the script please contact me. This CD was a retailer only freebie to promote the Vampirella Model Search Special comic and the impending new Monthly Series. The Quick Time Movie features the top models auditioning for the job of Official Vampirella Model (won by Maria Di Angelis). Good music, flashy special effects and a bunch of women in various stages of undress twirling about ... I'm sure you get the flavour of this CD. Harris created the movie on an Apple Mac, and when they published it someone forgot to make it cross-platform, so dealers with PCs couldn't read the CD! This was great for me as my local comic shop was going to bin it and gave it to me as a freebie as they know I have a Mac. At over 175 megabytes in size I don't think I will be hosting the movie on this site for others to view - I am going to be pushed for web-space as it is! If I get enough PayPal donations to be able to afford an extra £25/$50 per year to buy more space then I will reconsider.